Motherwell moved top of the Scottish Premier League after a dramatic away win against Dunfermline. Strikes from Michael Higdon and Jamie Murphy gave the visitors a 2-0 first-half lead. Chris Humphrey's 55th-minute shot appeared to put the match beyond the Pars, before a Joe Cardle double made it 3-2 with two minutes remaining. Humphrey and Nicky Law then combined to set-up Higdon who ensured all three points for Stuart McCall's side. New signing Tim Clancy was handed a surprise debut for the Fir Park side after Shaun Hutchinson missed out with a hamstring injury. And buoyed by their best start to a league season since 1977, Motherwell took control from the start against a Dunfermline side who appeared to be affected by nerves for the first time since their return to the top flight. Easily dominating the early stages, Motherwell's possession was rewarded in the 11th minute when excellent build-up play allowed Higdon to curl home from 18 yards after a one-two with Keith Lasley. With little positive response from the home side, the visitors went on to create chance after chance - Tom Hateley also coming close early on when he hit the post with a 30-yard free-kick. And it took just 25 minutes for Motherwell to double their lead. Murphy burst away from Gary Mason in the right channel and his 20-yard drive deflected off Alex Keddie and went inside Paul Gallacher's near post. 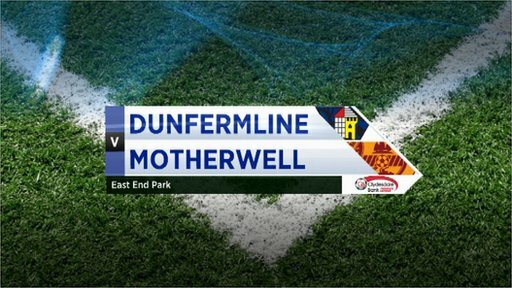 Motherwell maintained their superiority throughout the half, with Dunfermline struggling to enjoy any possession and with no real chances on goal. In a bid to address the problem, striker Andy Barrowman was replaced just after half-time by David Graham, but all the action continuted around the Dunfermline box with their defence very much at fault for Motherwell's third. There appeared little danger as Humphrey attacked the hosts from the right wing but the Dunfermline defence sat off, allowing him to cut in and fire a powerful left-footed shot in off the far post from 14 yards. The increased deficit prompted more changes to the Dunfermline line-up with youngsters Ryan Thomson and Paul Willis introduced at the expense of Gary Mason and Paul Burns. But it was a slice of luck that brought the Pars back into the match in the 69th minute. David Graham let fly from 30 yards and the ball hit off team-mate Joe Cardle's back and beat Randolph. And the drama and goals continued when Motherwell were caught on the break in the 88th minute after Lasley lost the ball inside the Pars' half. Cardle picked up and ran to the edge of the box before unleashing a low drive that took a deflection off Stephen Craigan and beat Randolph. With seconds remaining - and Dunfermline hunting for an equaliser - it fell to Higdon to steady the nerves. Motherwell played the ball from the back and Humphrey found Law inside the box with the English midfielder sending in a low cross that Higdon stabbed home from close range. 90:00+2:09 The match has reached full-time. 89:15 Nicky Law provided the assist for the goal. 89:15 GOAL - Michael Higdon:Dunfermline 2 - 4 Motherwell Michael Higdon fires in a goal from inside the six-yard box to the bottom left corner of the goal. Dunfermline 2-4 Motherwell. 87:17 Assist by Ryan Thomson. 87:17 GOAL - Joe Cardle:Dunfermline 2 - 3 Motherwell Joe Cardle scores a goal from the edge of the area to the bottom left corner of the goal. Dunfermline 2-3 Motherwell. 84:55 Joe Cardle produces a left-footed shot from the edge of the box and misses to the left of the target. 80:55 Michael Higdon concedes a free kick for a foul on Martin Hardie. Free kick taken by David Graham. 79:51 Effort from the edge of the area by Jason Thomson goes wide of the right-hand post. 78:44 Stevie Hammell is flagged offside by the assistant referee. Paul Gallacher restarts play with the free kick. 75:28 Joe Cardle produces a cross, Darren Randolph makes a brilliant save. 74:12 Corner taken right-footed by Tom Hateley from the left by-line, clearance made by Andy Kirk. 72:19 David Graham is caught offside. Darren Randolph takes the indirect free kick. 70:23 Unfair challenge on Andy Kirk by Tim Clancy results in a free kick. Martin Hardie produces a strike on goal direct from the free kick. 68:41 Assist by David Graham. 68:41 GOAL - Joe Cardle:Dunfermline 1 - 3 Motherwell Joe Cardle gets on the score sheet with a goal from inside the box to the top right corner of the goal. Dunfermline 1-3 Motherwell. 65:30 Free kick awarded for a foul by Andy Kirk on Tim Clancy. Darren Randolph takes the direct free kick. 63:24 Joe Cardle takes the free kick, Centre by Chris Humphrey, Stevie Hammell makes a clearance. 63:24 Booking Stephen Craigan is cautioned. 63:16 Free kick awarded for an unfair challenge on Joe Cardle by Stephen Craigan. 61:10 Inswinging corner taken by Joe Cardle, Header from close range by Andy Kirk misses to the right of the target. 60:26 Substitution (Dunfermline) makes a substitution, with Ryan Thomson coming on for Gary Mason. 60:26 Substitution Paul Willis comes on in place of Paul Burns. 58:37 Outswinging corner taken right-footed by Tom Hateley from the right by-line. 57:23 Jamie Murphy fouled by Andy Dowie, the ref awards a free kick. Direct free kick taken by Keith Lasley. 54:54 Assist on the goal came from Jamie Murphy. 54:54 GOAL - Chris Humphrey:Dunfermline 0 - 3 Motherwell A goal is scored by Chris Humphrey from just inside the penalty area to the bottom left corner of the goal. Dunfermline 0-3 Motherwell. 53:48 Corner taken right-footed by Joe Cardle from the right by-line to the near post, Alex Keddie produces a header from deep inside the six-yard box that clears the crossbar. 52:30 Substitution David Graham comes on in place of Andrew Barrowman. 45:00+0:28 The referee blows for half time. 40:38 Gary Mason concedes a free kick for a foul on Keith Lasley. Tim Clancy takes the direct free kick. 38:18 Shot from just outside the penalty area by Tom Hateley misses to the left of the target. 36:28 Corner taken by Joe Cardle, Andy Kirk concedes a free kick for a foul on Darren Randolph. Darren Randolph restarts play with the free kick. 34:41 Steve Jennings gives away a free kick for an unfair challenge on Martin Hardie. Jason Thomson takes the direct free kick. 30:38 The official flags Jamie Murphy offside. Indirect free kick taken by Paul Gallacher. 27:25 Free kick taken by Tom Hateley. 27:25 Booking Alex Keddie goes into the referee's book for unsporting behaviour. 27:22 Free kick awarded for a foul by Alex Keddie on Michael Higdon. 25:02 GOAL - Jamie Murphy:Dunfermline 0 - 2 Motherwell Jamie Murphy fires in a goal from just inside the penalty area to the bottom right corner of the goal. Dunfermline 0-2 Motherwell. 21:53 Stevie Hammell restarts play with the free kick. 21:53 Booking Paul Burns receives a yellow card for unsporting behaviour. 21:48 Paul Burns challenges Steve Jennings unfairly and gives away a free kick. 19:51 Andrew Barrowman gives away a free kick for an unfair challenge on Nicky Law. Shot comes in from Tom Hateley from the free kick. 17:29 Michael Higdon challenges Alex Keddie unfairly and gives away a free kick. Paul Gallacher restarts play with the free kick. 15:57 Effort from long distance by Martin Hardie goes wide right of the goal. 14:22 Martin Hardie concedes a free kick for a foul on Nicky Law. Stevie Hammell takes the free kick. 13:24 Unfair challenge on Alex Keddie by Michael Higdon results in a free kick. Free kick taken by Martin Hardie. 10:34 Assist on the goal came from Keith Lasley. 10:34 GOAL - Michael Higdon:Dunfermline 0 - 1 Motherwell Michael Higdon finds the net with a goal from the edge of the penalty area to the bottom left corner of the goal. Dunfermline 0-1 Motherwell. 10:09 Michael Higdon fouled by Gary Mason, the ref awards a free kick. Free kick taken by Steve Jennings. 9:00 Unfair challenge on Nicky Law by Martin Hardie results in a free kick. Steve Jennings takes the free kick. 8:16 The referee blows for offside against Paul Burns. Stevie Hammell takes the direct free kick. 4:56 Outswinging corner taken right-footed by Tom Hateley from the right by-line to the near post, clearance made by Gary Mason. 4:07 Free kick awarded for a foul by Andy Kirk on Stevie Hammell. Stevie Hammell restarts play with the free kick. 2:46 Unfair challenge on Stephen Craigan by Andrew Barrowman results in a free kick. Direct free kick taken by Stevie Hammell.